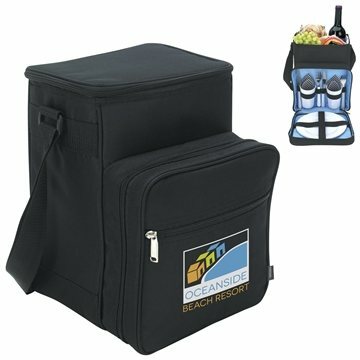 Ideal for your next outing, this picnic cooler features a large zippered opening to a fully insulated area for your favorite snack or meal. The front unzips to reveal a 2 pc setting. The adjustable shoulder strap with pad ensures easy carrying. Zippered front pocket for plastic plates, cups, cutlery and napkins (for 2 people). We received our order quickly and it looked good. the product and service was great. It is a rush order and done on time. We plan to give this product out like a marketing item, so it has to be fairly affordable. I am one of your biggest customers- keep comingback everytime. I am sure our employees will like them. Very large space. These bags fold flat easily, and do not hit feet. Well-made, a good buy..
Everything was more or less what I expected so I don't have any dislikes about the products. Clients and potential clients specifically ask us for these.